industry controller,HMI,motor controller,touch screen,PC software,FCS. - the Internet + era, customers can get your product trial experience without going to visit personally. 1. It can display products through real-time monitoring screen. 2. It can remote control and operate products via web page display. 3. Visitors apply for the operation experience through the short message. 4. It is based on the Web server form (Web site). Users can use the browser to operate, install.Maintain is convenient. 5. It can be used independently. It can also be embedded in the company's Web site to use too. 6. We can custom system according to products’ different functions. 1 It can show sellers’ products through the Internet. Customers can remote operate products. 2 It can be used in automation control field, remote control / video surveillance applications. 3 It can be used to smart home video surveillance and remote control. 4.It can be used to explain and operate in remote video teaching. 2.Industrial automatic controling or monitoring. 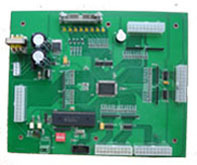 3.Embedded modules in automatic equipments,add network control functions to the equipments. EM12 is a compact Web server for the system to increase web access. 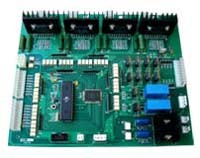 The system is connected with the user system through the serial port DB9, which is convenient for integration into the user system. Web operations can be operated (input data, button click, etc.) into a serial data output to the user system. It can receive user system through the serial port data displayed on the web page too. It can drive text according to the data; other functions are picture switching, animation display. It can be used in LAN and WAN. Redevelopment is convenient. It’s powerful; you can almost use it as the company's Web server. (1) Efficient 32 bits embedded processors. (2) USB HOST、 USB device interface. (4) SD card interface . (5) True colored screen with TFT. (6) Touch screen control function. (7) Audio file play and video file play . (1)Two independent drive outputs of PWM DC motors to control their speeds. (2)Control speed of common brush DC motor free. (3)Five analog inputs to set arameters. Application：Control speed of DC motor,simple logic control. (1)Two stepping motor drives,maximumoutput electric current is 2.5A.It can drive stepping motors such as 42、57. (2) functional subdivision to outputs of stepping motors. (3) Parameters can be setted easily with eight bits LED and youcan check on status easily. (4) Nine bits key outputs. (5) Two drive outputs of PWM DC motors. Application：Electronic control of small mechanical systems. of 8 bits efficient MCU and CPLD. Applications：Movement and position control in industry circumstance. Characters:LCD interface is good for visuality of roducts.Convenient operation and promote level of products. (1)32 bits ARM7 core，industrial efficient processor. (4)Eight analog outputs,A/D converter of 10bits precision. (5)Erase and write EEPROM chip on line. Application：Field control of all kinds of industrial machines. (1)Intel 16bits 80C196 MPU processor. (2)ALTERA EPF10K10　high-speed FPGA chips. (5)RAID 32.768KHz crystal oscillation system and 40M oscillator. hight speed ouput and serial ommunication. Applications：Real high speed,multi-data and complex caculation. (1)Efficient RISC processor and CPLD structure. (4)Three bits LED.You can set parameters or check on statuses. Applications：It is suitable for high reliability,multi I/0 ports field. (1)32 bits ARM7 core processor and FPGA double cores structure. (2) High speed and parallel mutli- channel A/D transformation. (1)32 bits ARM7 core.Efficient processor of industrial standard. (7)Key inputs of eight bits. (1)32 bits RM7 is core,industry grade efficient processor. (3)TFT real color LCD interface. new generation produced by Siemens. RS232.single power 3.3V-5.5V，support three audio's transfer speeds.GSM Phase 2/2+ standard. because of the quick identification. (1)Measure signal inputs of eight channel,display in a cycle of each channel. (2)Ranges of input signal and faults of input sensors are constantly monitored.If they are beyond limits,alwrts will turn on. (3)Each channel can set alert data seperately. (4)You can free choose twelve ranges .